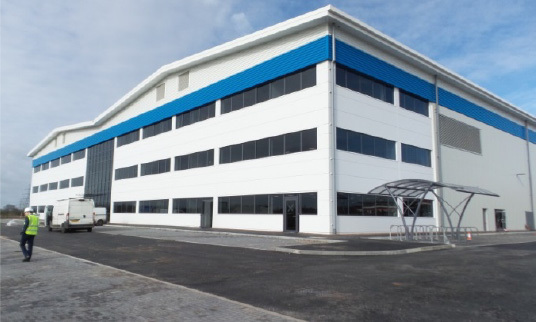 Le Masurier, the Jersey property investment and development company, have completed on the construction of a new 100,000 sq ft warehouse and headquarters facility for the First Choice Group, just off the M6 Toll Road in Cannock, Staffordshire. Le Masurier as funder, in partnership with developers Opus Land, worked closely with the tenant from the outset of the £9m project. First Choice Group is the market leader in the commercial catering industry. The firm provides equipment, in addition to on-site training, which can all now be provided under one roof from their new headquarters. Brian McCarthy, Managing Director of Le Masurier said “as the property is located just off the M6 Toll road, it provides unparalleled distribution access across the UK. The warehouse and offices provide a BREEAM Very Good rating and represents a big step for First Choice as the Group will be consolidating from a series of smaller units into this prominent new development. Staffordshire County Council provided Le Masurier with a £800,000 grant towards the project recognising the value of significant inward investment”.